Basically I want to do slomo when enabling aim but for player and current weapon I want normal time dilation. This way I will be able to fire normally without slomo. Devastating feature… that’s why player will have only 6 seconds to aim during gameplay. Use wisely. So basically when we enter aim mode widget will toggle progress bar. I will update this widget from GameplayCharacter when we will be in aim mode. This will make sure to update the progress bar and text. This way rifle will fire without slomo. First thing to do is to update GameplayCharacter. Draw Size: 300 x 100. AimRate float Holds aim interpolation from 0 to 1. Will be used in AnimBlueprint as well to interpolate the hands. AimTimeLeft float – default 6 How much time left for aiming. AimTimeLeftMax float – defautl 6 Maximum time that player can aim. AnimWidgetActiveLoc vector Time information will be in UMG added as widget. We need to hold active and inactive aim widget location. bIsAimDeactivated bool Aim will be managed in Tick and I need to be sure that this part of Tick won’t be triggered when we don’t have AimTimeLeft. RequestAimDeactivation bool Before deactivating aim we need to interpolate gun, widget and hands to proper location. Widget location will be interpolated between those two locations. Make sure to add DisableAim custom event. It should be straightforward. This will manage aim mode toggling and inform UMG. 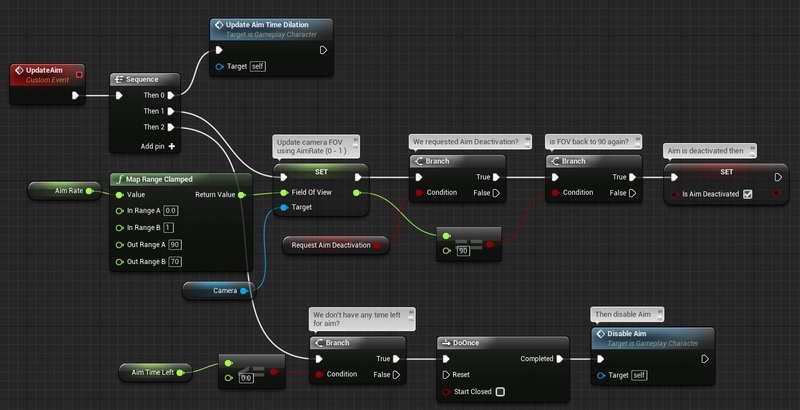 This is handling AimRate (from 0 to 1) to change Camera FOV and later update hands animation in Anim Blueprint. It’s decreasing time left as well and updating UMG widget. Last thing is manage Time Dilations. Aim mode leave Character and Current Weapon with normal time dilation so you can normally shoot and everything else have slomo. This is actually updating FOV and checking if we have Time Left. If not – call disable aim and when FOV is again at 90 deactivate aim tick. And that’s all in Character! 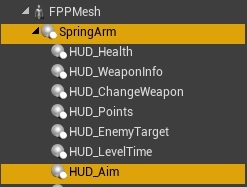 Open HeroFPP_AnimationBlueprint and add one float variable named AimingAlpha. This way I don’t need to interpolate the value again. It’s done in Character as it drives FOV as well. I can use the value here as well. So basically when we are aiming b_Root bone location will be increased by 13,0,4 with interpolation.